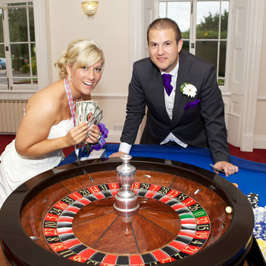 Wedding casino hire has proved to be an ideal way to start the wedding celebrations as guests both young and old will enjoy the experience. 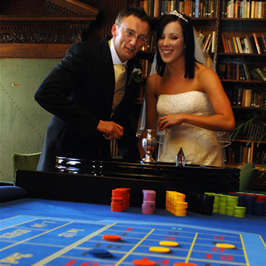 Our fun casino can be your only source of wedding entertainment or it can be combined with music and dancing. At the start of the fun casino at your wedding reception our croupiers will provide your guests with fun casino playing money. Your guests will then be able to exchange these for playing chips at the gaming tables. All of our play for fun casino games will be explained in full by our friendly and experienced croupiers, but we find that the guests who are first to play have delight in sharing their new found skills with their fellow guests. The gaming is purely for fun, but you may, if you wish, provide prizes for the ‘Top Winners’ of the evening. 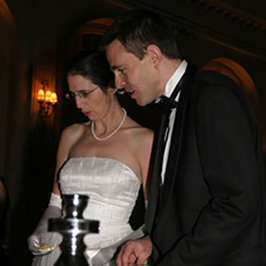 We never forget that although this is our daily business it is your once in a lifetime wedding celebration and we will treat it accordingly…..
We suggest that play commences at the earlier part of the wedding reception as our fun casino is an ideal way for guests to come together and break the ice at the casino tables. By the end of the fun casino session all will be warmed up and ready to hit the dance floor. Prior to the big day we will assist with the arrangements. We do not need to know the exact timings required until you have had your final planning meeting with the venue. We will then liaise with your wedding coordinator to help ensure that your wedding day runs as smoothly as possible. We will arrange the setting up times direct with the venue at a time that is suitable for all and when guests are not within the area that the fun casino will run. As sometimes is the case you would like the casino to be a surprise for your wedding guests, we will discreetly set the tables up while guests are within another area of the venue. If you have any event happening within the casino playing times it does not interrupt your guests enjoyment to stop the fun casino for 10 minutes or so while the first dance / cake cutting / fireworks etc is taking place because you will want your guests full attention at these special times. Again, we will liaise direct with your wedding coordinator regarding this in order for your wedding reception to run smoothly and seamlessly. We are happy to supply references as assurance of our professionalism and reliability to supply luxury and authentic casino tables with friendly croupiers. Our commitment to ensuring that the smallest details are correct ensures that the bigger picture is one of success for your wedding reception. Your guests will be talking about the fun had at your wedding reception long after the honeymoon tan has faded!